Thanksgiving is a joyful time of celebration and reflection on the good found in fellowship and family. The Praise of Man or The Praise of God? As I battle sin, it's been good for me to remember afresh that all the weaponry I posess belongs to Him, and my first maneuver must be to put on Christ. In Jesus, you can experience true, life-giving, family. Read Scripture has provided a great video on the Gospel of Mark that gives you a brief but informative overview of the book and a general idea of where we will be moving on Sunday mornings. Stoke the fires of repentance and faith through fasting. Let us go forth in confidence that we serve a triune God, and in the power of God the Holy Spirit let us make known among all the nations God the Father's plan for redemption through the saving work revealed to us in God the Son. Recap of Part One of our Institutes Class on Sunday mornings at 9:30. The effects of sin have always led to the dehumanization of certain people groups. But, by grace, we can be the change. Watching a 5 year vision come to fruition is very overwhelming and emotional. 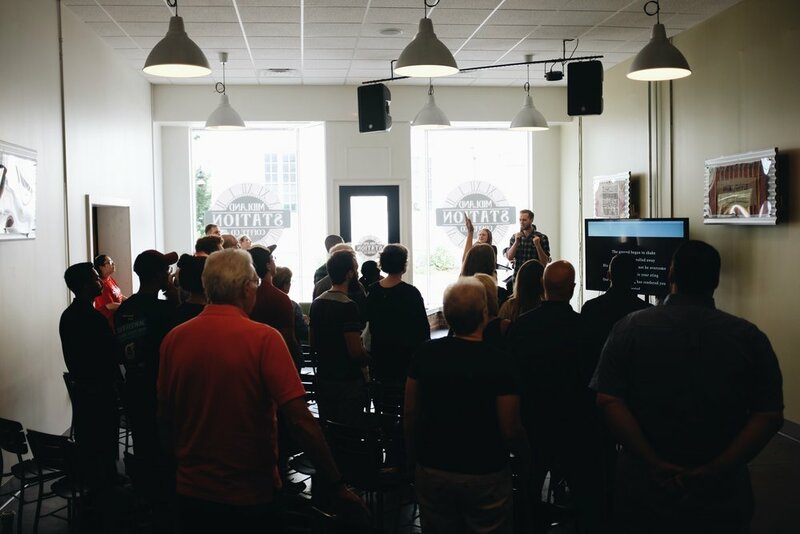 This is what we experienced Sunday June 25 as we gathered at our new location Midland Station Coffee Co. It was a great night of worship, fellowship, and teaching. Our group is a picture of what Jesus does with people who come to the end of themselves and finally trust Him in every area of life. Sola City Church had its first monthly gathering in Lakewood Baptist Church’s “Unplugged” space in May. This was a great night where we met many new people, saw the fruit of Jesus using us in building relationships in our city, and a time where we gathered around the Word answering the question “What is the Gospel?” Last Sunday night was the second monthly gathering as we sought to build off of the foundation that was laid in May. We started the night with Matthew 16:16 (This is where we will start all our gatherings over the summer) for we see that upon the confession that “Jesus is Lord”, Jesus himself will build His church. It is kind of freeing to think of this: that God is not looking for us to perform but to gaze in wonder at Him. So, we started here to try and rid ourselves of any works righteousness we may have been bringing into the night. One of the dear brothers in our group, Esaias Perry, also shared during the night. As we talked shortly about Sola City’s Mission Statement, Esaias shared about how He and his family is working out this mission in their individual lives as well as their family as a whole. Matthew and Ashley Walls followed Esaias by discussing how they have been blessed by the community in our church, being made more like Jesus through healthy and Gospel-centered relationships. We concluded the night by discussing and answering the question “Who Are We Now?”, the second of three questions in our Theological Vision that seek to provide clarity for our members on how we do ministry as a church. Here we discussed, through the lens of Acts 2:42-47, what our identity is as a church as we believe in the Gospel. What Jesus has done to this point is nothing short of supernatural. He is pouring our His Spirit in a beautiful way, and we believe that this is only the beginning of what He has in store for us in Gainesville. Maybe you can pray about how you can be a part. "Lord, are you calling us to plant a church in Gainesville? If so, we are in. If not, make it clear." As each salvation passed and each person became more assimilated into our church and community, we heard and experienced a calling and desire to step out into the long and hard work of church planting. For the record, We don't know what we are doing. Fresh out of seminary, I feel more prepared to write a paper than preach a sermon. But the good news is the builders labor in vain unless the Lord builds the house. All we are bringing to the table is our need for him. We don't know what works and what doesn't. That's part of the beauty of it. We just see our need for Him. We see our failures and are enthralled by His sufficiency. We see our sin and are captivated by our Savior. We don't have it together and we know we don't. But we are confident in Christ, and that's enough. - What is the church called? Sola - Sola is a Latin word rooted in the Reformation when the church recovered the essential doctrines of Evangelical Christianity. Sola means "alone" as in the Gospel alone is sufficient for all of life. City - City is strategic in that the heartbeat of our ministry activities is rooted in a ministry vision for our city, Gainesville. We believe that God loves cities because He loves people. Our Sunday gatherings will be downtown off the square and the bulk of ministry will occur within a 1-mile radius of the Gainesville Square because that is where the majority of city activity occurs. - What do you believe as a church? Please visit for solacitychurch.com/about-us for a more detailed look at our beliefs as a church. - How many are in your core team and what is the makeup of the group? We have 20 adults + children. Our group is predominantly young married couples, young families, and singles. God's grace has been poured out on us in a strategic way in that we are ethnically and culturally diverse. The cultural makeup of our core team is very similar to the makeup of our city (40% white, 40% Hispanic, 20% Black). This helps us better do ministry as we labor for transculturalism and multiculturalism among our congregation (involving, encompassing, and combining elements of more than one culture into one unified body of believers). -Are you affiliated with any church planting organizations? We are affiliated with North American Mission Board and Cor 3:6 at the moment. -What is the immediate way that I can be a part? We desire for people to join the work that God has begun in Gainesville. One of the most fruitful ways that you can partner is to join our team. If you are interested in attending one of our worship services or simply attending a community group in the city, email us at info@solacitychurch.com. With that said, we are beginning monthly gatherings starting this month. Here, you will be able to connect with other members, pray with us, read scripture with us, and explore what it may look like for you to be a part of what God is doing here in Gainesville through Sola City. You can also partner with us by praying. There are many areas that we desire to see breakthrough in our city. As we labor in the trenches in ministry on a daily basis, we know that prayer is used to enact God's will, or pointedly said, prayer molds us to God's will. Please email info@solacitychurch.com for more details on how you can pray. You can also partner with us financially. Please email info@solacitychurch.com for more details. Our major need at this moment is prayer. We are desperate for the Holy Spirit to move in a way that we have never experienced. We gathered last night in our family room to read, study, and pray, and the expectancy that we had for Jesus to move was tangible. We do not want to take one step if the Lord has not gone before us. Another need we have is for older couples to step out in faith and join the work that God is doing. We believe that we will be more effective in ministry if we continue to develop a demographic in membership over 35 years old that bring years of seasoned wisdom to the church and its ministries. If God is leading you in this way, please email info@solacitychurch.com. -What is the next event that we could attend to hear more about the church? This Sunday night at 6pm we are hosting the first of our monthly gatherings as a church. Here, we will gather to fellowship with each other, join with each other in worship through song, hear more of the vision of Sola City Church, and explore how we can spread the supremacy of God through the Gospel of Jesus Christ to our city and beyond. We are believing that these monthly gatherings will give us momentum for our public launch in the Fall. If you would like to join us this Sunday, we will be meeting at 6pm at the Lodge on Lakewood Baptist Church Campus. Please email info@solacitychurch.com for more details. We desire to do God's work, in God's way, for God's Glory. I say it often with our group,"We can manufacture something in our city that is truly commendable. We can gather lots of people and see much good done in our community. But unless the Lord empowers us to do His Gospel ministry, we will never reap any spiritual and eternal fruit." Let's press in to Jesus together. My family's journey to this stage of life and ministry has been nothing short of crazy, yet it has been full of God's grace and provision at every step of the way. Whether it has been the birth of the twins, a couple moves to new houses, juggling ministry, work, and seminary, our lives have been nothing short of exciting. But isn't that typical when following Jesus? While I was attending college, I knew that Jesus was calling me into pastoral ministry. I carried a burden during those years to see the Gospel go forth on our campus. And, over the course of two years while in college, Jesus allowed us to bear much fruit. Bible studies began to break out among the sports teams on campus, homosexuals came to profess Christ for the first time, and lots of other fruit was bore as we sought the good of the campus through evangelistic ministry. When I graduated, Jessy and I got married not long after I took a youth pastor position at a local church. I thought of youth ministry as the minor leagues: the best way for a young guy to get exposure in the ministry without having to carry the burden of a 40 hour work week in the secular world (I do not believe this now, nor was my view correct then. Youth ministry is much needed, but those who get into youth ministry should be called specifically to it and not feel that a general call into preaching ministry means youth ministry for a few years). I was part-time and full-time at a couple of churches and felt an empty void and dissatisfaction where nothing would suffice. Ministry began to quickly become a burden as I was constantly let down by others, frustrated with institutionalized "church" life, along with a host of other factors. Spiritually, my cynicism was a major problem that revealed something deeply rooted in my heart: I was making ministry an idol. So we picked up and moved to Gainesville. I stepped out in faith, quit my job in the church, and prayed that God would open up an opportunity for me to get a job in the city. Little did we know that this decision would be the catalyst that increased our ministry and allowed us to step deeper into our calling to plant churches (I wonder how many young guys miss a major move of God because they don't see bi-vocational ministry as an option). We also joined an Acts 29 church in the area and just became church members. For the first time in our ministry, we allowed ourselves to be loved on by the church; we learned how to be vulnerable with others; we began to understand our identity not through what we did in pastoral ministry, but through what Christ had victoriously done on the Cross. And this shift in perspective was freeing for us. "Humble yourselves under the mighty hand of God so that at the proper time He may exalt you." "Okay, Lord," I said. "We are just going to wait on you. You lead the way. We are burnt out on trying to do ministry in our own way (After all, God's work done in our way is actually not God's work. It's ours.)." God is found in two places in this passage: (1) in the highest place, Heaven, and (2) in the lowest place, our contriteness of heart. I know that, historically, all of my attempts were to build my own tower, my own empire, to try and climb a ladder to Heaven, to God. That is probably the default for most of our hearts. And these attempts were futile and pointless. The giving of the Law in the OT was God's word against this type of self-righteousness. That is why Paul says in Galations 3, "[The Law] was added because of transgression." This was God's way of saying to pastors (namely, me), "You cant build your way to Heaven. Your little kingdoms can never reach my heavenly kingdom." But the good news is that God is found somewhere else as well. He is found in our lowliness, our humility. He is found in our self-forgetfulness, not self-righteousness. Our journey this far has proved one thing: when I finally come to a place to where all I can boast in is Jesus, that is where I am freed from myself and finally freed to live unto God and for God's work. This is what began to happen in mine and Jessy's heart over the last few years. I interpreted my step out of vocational ministry as a first step of repentance. It was me saying,"Lord I do not have to have ministry if it is not Your will." So, we joined a church plant as I stated earlier. And over the past few years, we have seen the Lord do some pretty incredible things. I have slowly stepped in to different ministry opportunities. The most fruitful of these was when we began leading a community group. Here, we have experienced how the church is a family that carries each others' burdens. We have wept together, rejoiced together, sent missionaries to the nations, and enjoyed the riches in the Gospel with one another on a weekly basis. In the midst of our leading a community group, we got practical experience in a young church plant, something that has proven to be invaluable for where we are now. Through our faithful and spirit-filled church, we were reminded of the Gospel week in and week out. We experienced the power of the Word of God and learned to trust in power of the Gospel to do the work of ministry. We were led by gracious and servantlike leadership that set an example in our own discipleship of how to lead a church. We were pointed to Jesus over and over again. Our group began praying fervently 3 years ago about how God would use us as a community group in the city to carry His Gospel to people. He has led us to the darkest places and the most hopeless of hearts, allowing us to take the Gospel torch to the far reaches of Gainesville. As time has been the test, the last few months we have begun to see fruit of a church planting core team being developed. With young couples, singles, and young families making up the group, the Lord seems to have brought us together for such a time as this to plant a church. Again, though, we are waiting on the Lord to move and lead us. On the 500th anniversary of the reformation, the year that Martin Luther nailed his 95 Theses on the church door in Wittenberg, Germany, the Lord has opened an opportunity for us to plant a church in Gainesville with a small core group of 20 adults + children. We have sought counsel and wisdom from other seasoned men and women who have gone before us in church planting, we have been assessed through North American Mission Board and Cor 3:6 Church Planting network, and the Lord seems to have opened the door for us to start this work in Gainesville. We could not be more excited for the days ahead. There will be posts to follow that provide more information for how you can be a part of this work. Let's see what Jesus might do. Also, you can visit our website at solacitychurch.com. 1. Necessary components for growth and maturation as a follower of Jesus include faithful and consistent Bible reading and constant fellowship with other Christians. The Scripture Engagement tool encourages and facilitates both of these. You get to hear from other brothers and sisters on what the Spirit is speaking to them through the Word of God. 2. This is another avenue where you can renew your mind through meditating and reading Scripture. 3. Technology runs our world so involving yourself with this tool will cultivate a deeper understanding of technology. 4. Engaging Scripture leads to deeper understanding of the story of redemption revealed in Scripture. 5. Scripture tells us that spending time reading Scripture can lead to killing sin (Psalm 119:11). The radical sayings of Christ expose our self-protective reflex. White-centeredness highlights the actions of the majority culture as normal, authoritative, and foolproof. Gospel-centered community should not be a burden for the Christian. A covenant of works does that. But as we are renewed and the Gospel is effectually believed in and applied, Jesus does something among His bride that is truly supernatural and unexplainable. I hope that this website has already been helpful to you and your walk with Jesus, hopefully translating into your involvement in Sola City Church. Look around, pray about the ministry God is calling you to, and go ALL IN as we seek to cultivate authentic Christian community marked with love, missional fervor, and Gospel power!